In this article, we'll walk through printing a very basic example of manually picking and placing a component within a 3D printed body. NOTE: This example is merely for demonstrating the process of picking and placing a component, rather than practical application. In the example below, we'll be printing a simple, pre-made inductor (see Picture 001) that powers an LED off Radio Frequency (i.e. "RF" from here on out). In the build, there is a single component embedded into the print, which is the LED. The antenna for induction is made of silver. The body is made of plastic. Picture 001: The RF Inductor with the LED. First you will need to download the .STL files that comprise the silver trace, plastic body, and LED component for the sample. The archive can be located in the downloads directory on the support site. It is called "RF Inductor with LED". 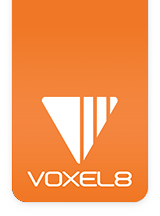 Once you have the pokerchip file it's time to get them into the Voxel8 Dashboard. Once the files have been downloaded, you'll need to upload them into Dashboard for assigning material types and for slicing. 1. Extract the files from the download, and then upload the .STL files into Dashboard all at once, including the plastic (i.e. PokerChip01_asm_Plastic.STL), silver (i.e. PokerChip01_asm_Trace.STL), and component parts (i.e. PokerChip01_asm.STL). NOTE: The other SolidWorks files (.SLDPRT) can be used to refine the models. Picture 002: File listing of the pokerchip zip. 2. Assign all .STL files to respective materials in the loaded assembly (see Picture 003A-C), including body (A), silver (B), and component (C). Picture 003: The .STL files needed to print the poker chip inductor. 2. Slice the inductor print build after assigning the materials assigned (see Picture 004). Picture 004: Saving and slicing the poker chip. 3. Send the build to the Voxel8 Developer's Kit printer. Picture 005: Sending the poker chip to a Developer's Kit for printing. 4. Setup the printer for plastic and silver as described in the Visual Start Guide. 5. Start printing the pokerchip inductor (see Picture 006). Picture 006: Printing the poker chip inductor. 6. When the printer is ready for insertion of the LED, it will pause (see Picture 007) and wait for you to insert the component expected. Picture 007: The Developer's Kit Printer has paused and is waiting for component insertion before continuing. 7. At this time you will manually pick and place your LED into the thermoplastic body. Be sure that the orientation of parts you place are correct (e.g. resistors might not matter, but LED and other electrical component parts with polarity will). TIP: It is best to use a pair of good tweezers to pick up electrical components to place them into the cavity (see Picture 008). Picture 008: Manually picking and placing components with a cavity (i.e. LED insertion here). Picture 009: LED has been placed within cavity. NOTE: In this example, we have not used epoxy to hold down the LED component. However, that is recommended if you are printing components within a surface of a printed assembly that does not seal off components from movement (e.g. a flat 2D plastic board with components on top). 7. After placement, you will continue printing the RF pokerchip part using the "resume" button (see Picture 010). This will seal off the component within plastic layers so it is not removable, electrically connected, and well seated within the structure (see Picture 011). Picture 010: "Resume Print" needs to be pressed after placing an expected component. Picture 011: LED is placed and printing can continue. 8. When the print is completed, you can test your completed part by applying an powered RF field around the poker chip to activate the LED in the print. Since the Voxel8 filament color is dark, you'll need to turn off the lights to see it "in action" below the subsurface of the first layer on-top of the LED.